Although building your patio over a concrete slab helps to ensure it won't settle unevenly later, you can build a patio without cement. By laying flagstone, tile, brick or other sturdy, flat pavers on a well-prepared base, your patio will be less expensive and more water-permeable. This method also allows for easier removal of the patio should you tire of it or decide you want to move it elsewhere. Your cement-less patio can take on a variety of patterns. 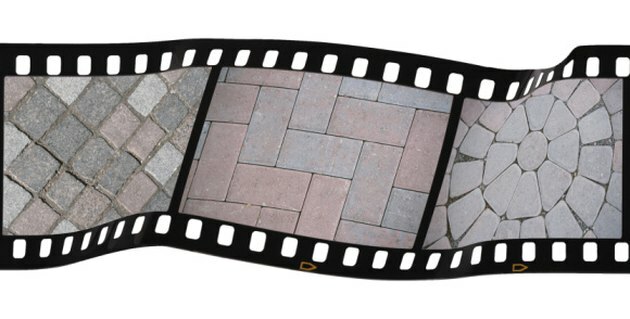 Choose and purchase the paving material you want to use for your selected area. Measure the size and calculate the area by multiplying the length times the width. You can buy paving materials from large hardware stores, home stores, some garden suppliers, tile outlets or construction material retailers and wholesalers. Dig out the area in which you want to build the patio. Remove the top 4 to 8 inches of soil evenly from the area, moving all roots and rocks. Line the outer edges with bender board or similar material, holding it in place temporarily with stakes. Moisten the area lightly with water. Fill the bottom with road base to a depth of about 2 to 4 inches. You can also use 3/4-inch gravel, crushed recycled cement or another similar product. Moisten the area lightly again. Add another 2 to 4 inches of sharp sand and fit your pavers together with the gap you want between. If you leave larger gaps, plan on filling the exposed cracks with carpeting groundcover plants or decorative gravel. Moisten the sand again. Fill between the cracks with more sand until it overflows. Leave it for a few days to let the sand settle and work into the cracks. Sweep the sand over the pavers and water it in lightly. If you are planning on filling large gaps with plants, you are ready for planting. When finished, wash it down lightly one more time.